Ordering one of our handbags can be kind of confusing, we know! We love that we can offer our customers custom made, one of a kind items. We do have our standard styles, sizes, and stitch patterns, but our handbags are handcrafted one at a time, and changes can be made. This makes the possibilities almost endless! 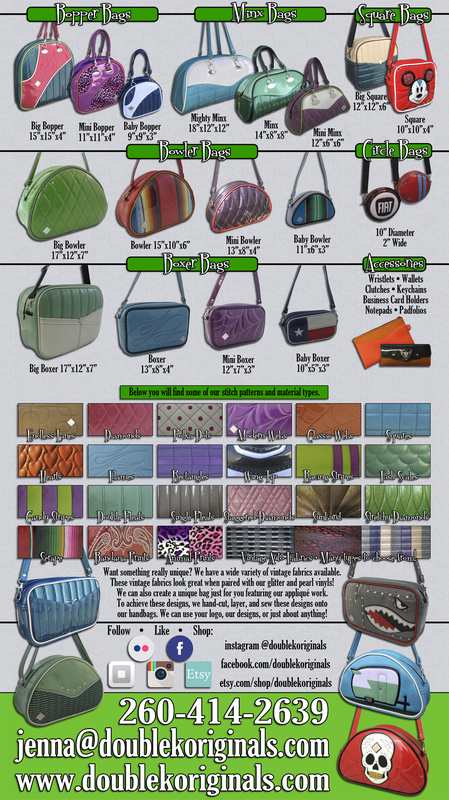 Based on our current materials, colors, sizes, and styles of bags, there are thousands of combinations available. We have hundreds of photos on our Flickr and Instagram. It is easiest to start browsing and see what catches your eye. We offer different styles of bags: Bowler, Boxer, Bopper, Minx, Square, Atomic, Cruiser and Circle bags. Within those styles, we have multiple sizes of each. The sizes and styles are shown below. From there, you choose your stitch pattern, some of which are shown farther down on this page, but not all are listed as we are constantly designing new patterns. Then, you choose your materials and colors. Our most popular material is glitter vinyl, currently available in 25+ colors. We also have shimmer, pearl, and matte vinyls available. We have a wide range of fabrics, including vintage automotive fabrics, serape blankets, bandana prints, and fuzzy animal prints. To view all of our materials, just visit our website. We try to stay on top of keeping all of our offerings current on our site. Thank you for your interest in our glittery goodies, and if you have any questions about our bags, please feel free to e-mail us! NOTE: Currently not pictured is our Cruiser bag and our Atomic bag.